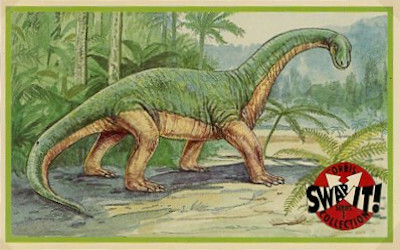 Size (Inches): 96 @ 4-3/16" x 2-1/2"
One of the best sets I have found (if you ignore the distracting "Swap It!" 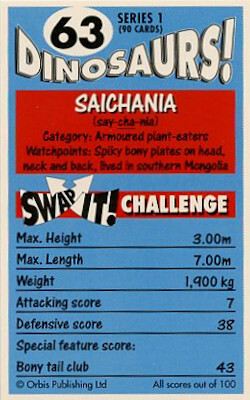 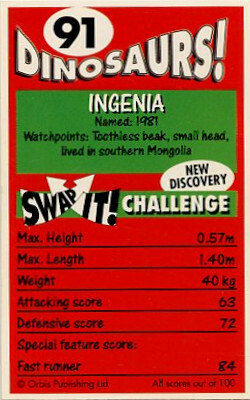 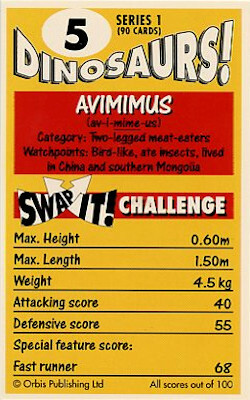 logo featured on the fronts of the cards). 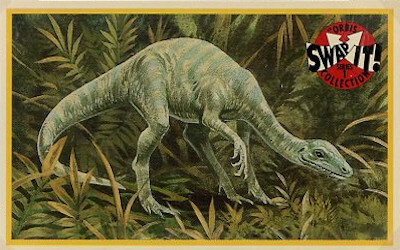 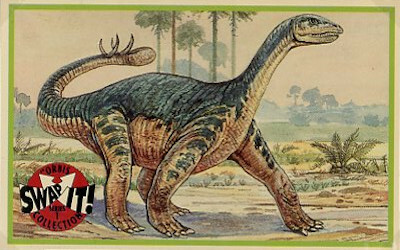 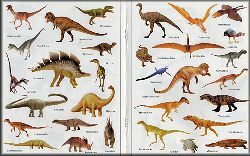 The artwork is fantastic and there is a very large and interesting selection of dinosaurs. 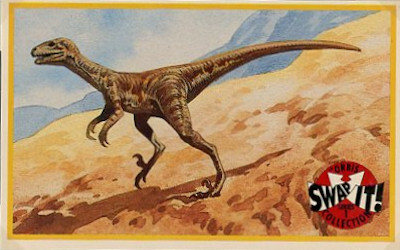 This set carries the title "Series 1" but to date I have not found any follow-on sets. 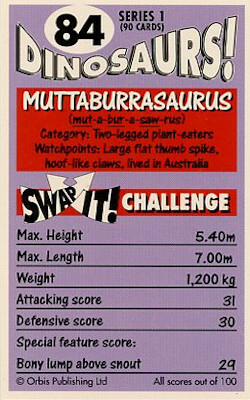 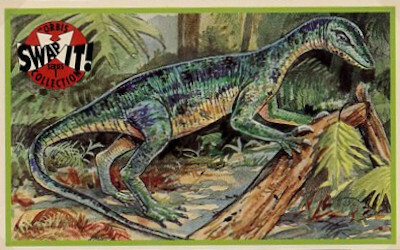 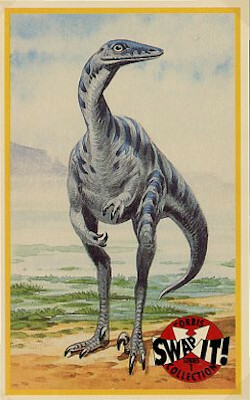 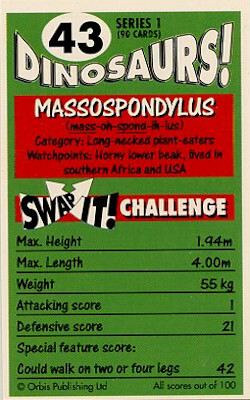 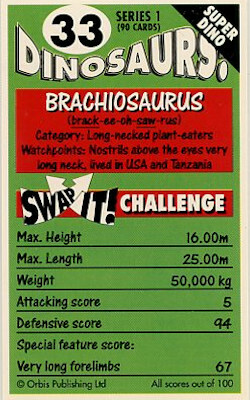 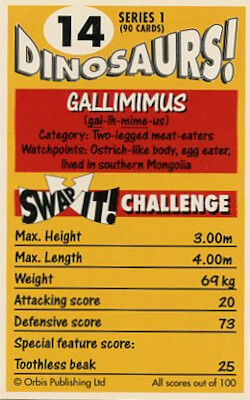 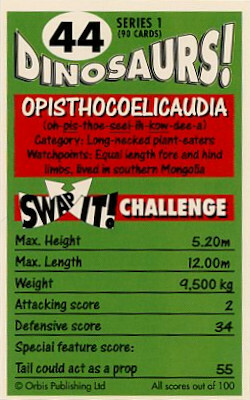 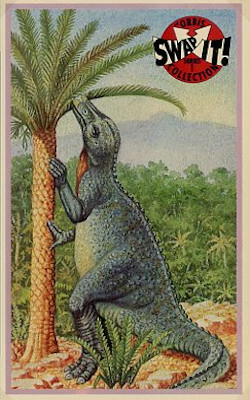 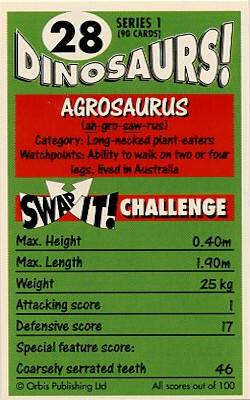 The cards were issued in distinct subsets; #1-25 (Yellow Backs, "Two Legged Meat-eaters"), #26-48 (Green Backs, "Long-necked Plant-eaters"), #49-70 (Blue Backs, "Armored Plant-eaters"), #71-90 (Purple Backs, "Two Legged Plant-eaters"), and #91-96 (Red Backs, "Recent Discovery" Dinosaurs). 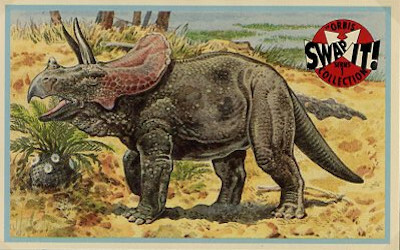 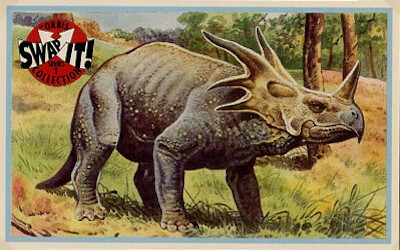 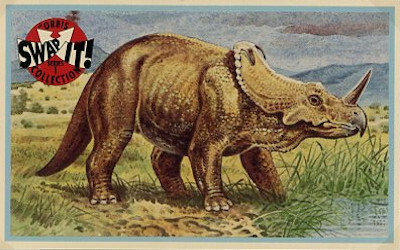 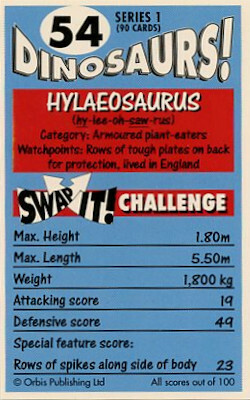 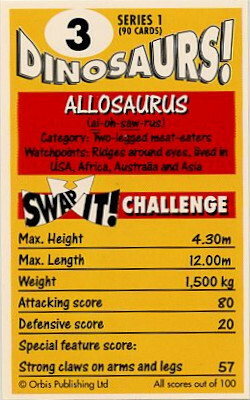 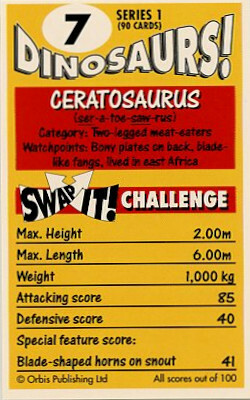 There are 10 "Super Dino" cards which have a gold foil triangle and Swap It! 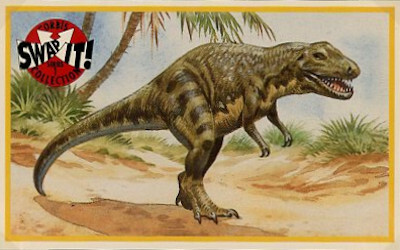 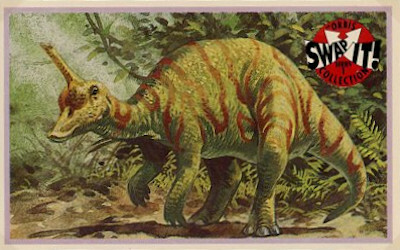 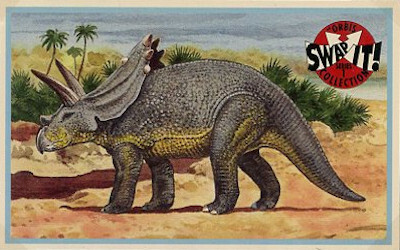 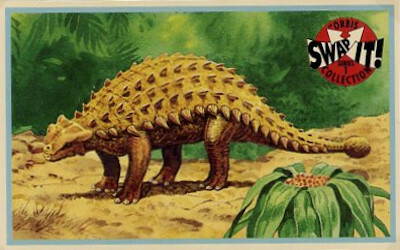 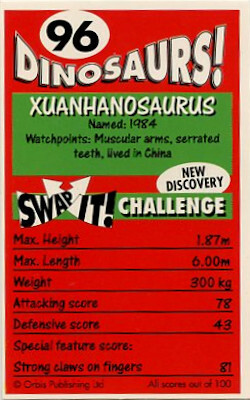 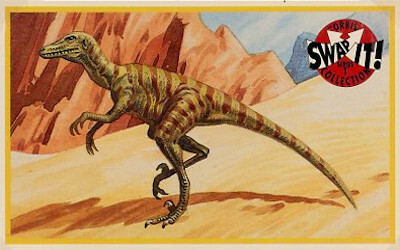 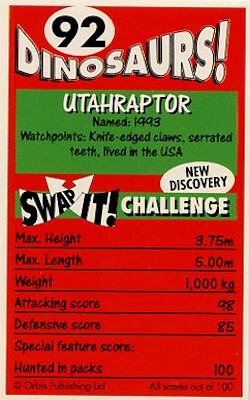 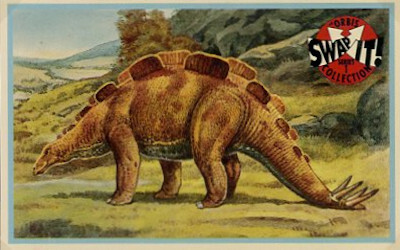 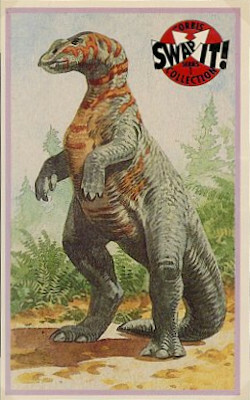 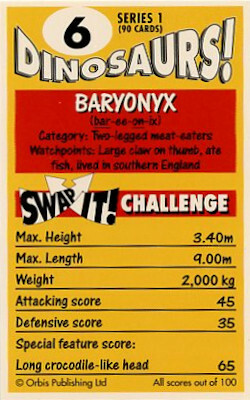 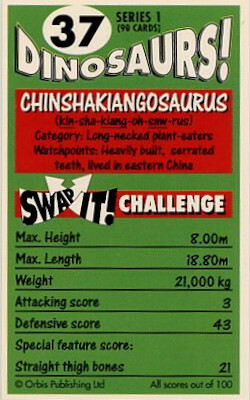 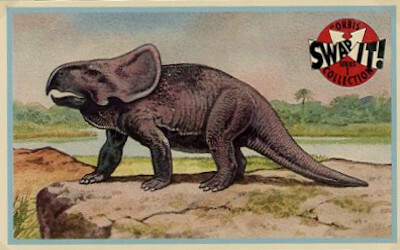 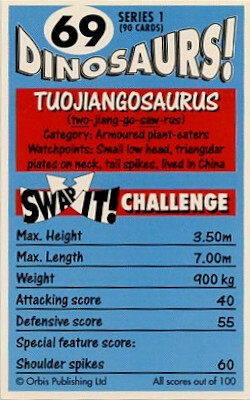 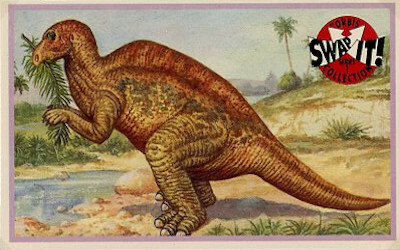 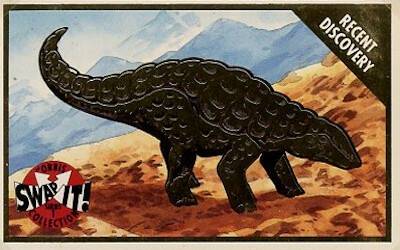 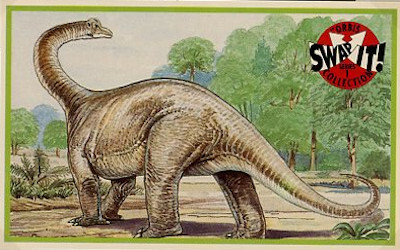 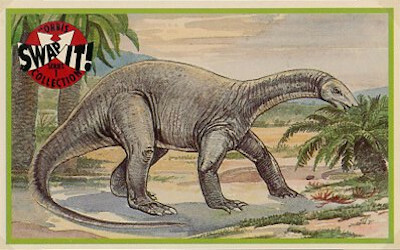 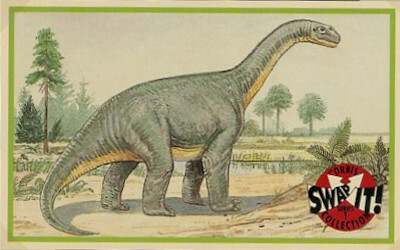 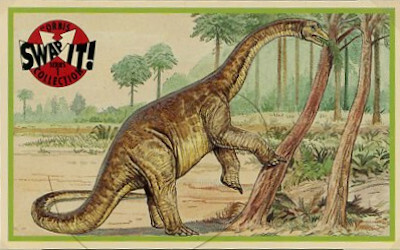 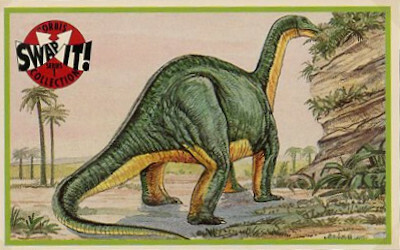 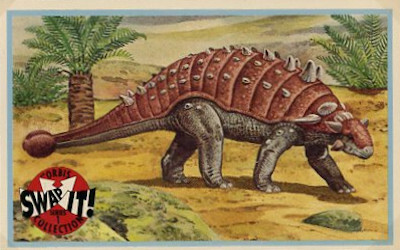 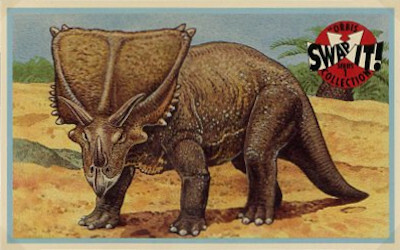 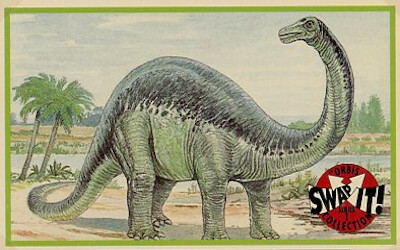 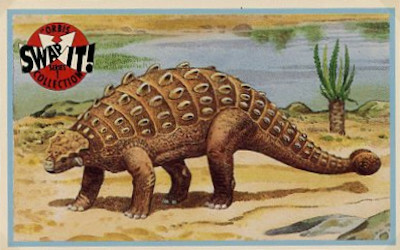 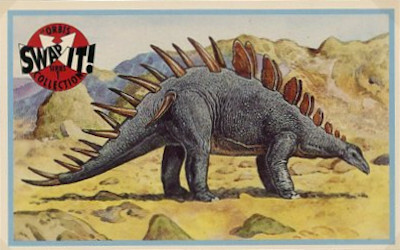 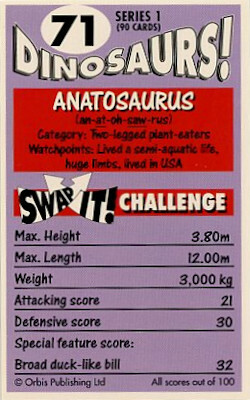 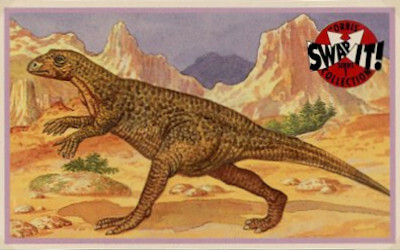 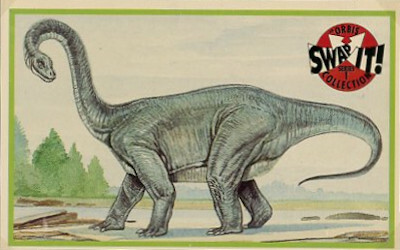 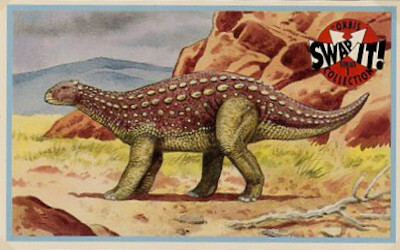 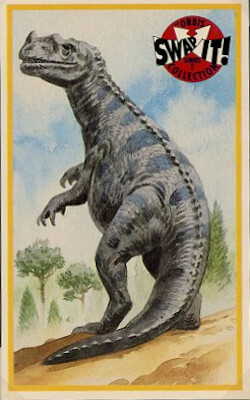 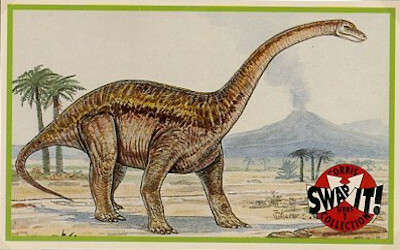 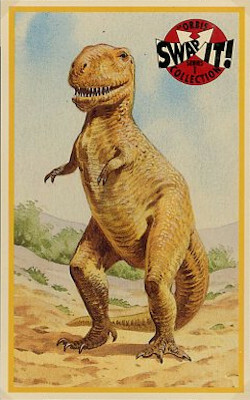 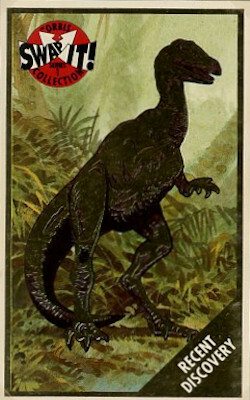 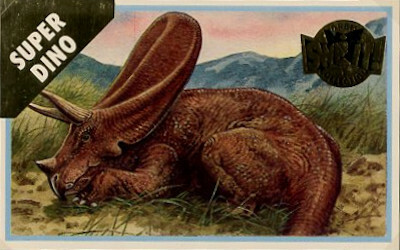 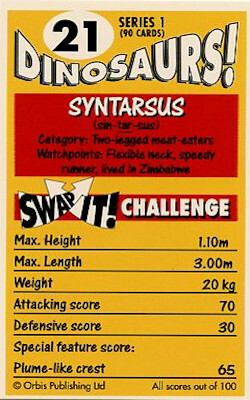 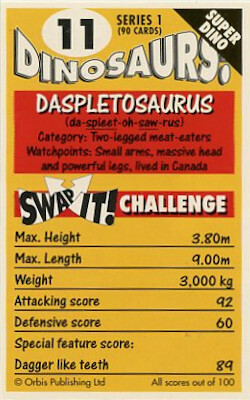 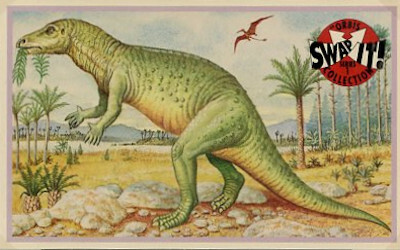 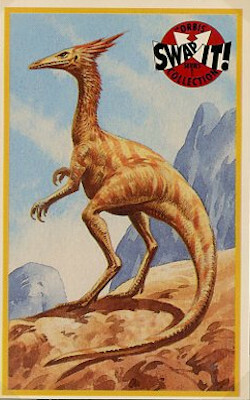 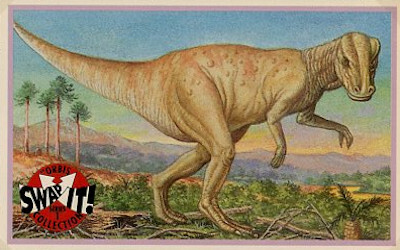 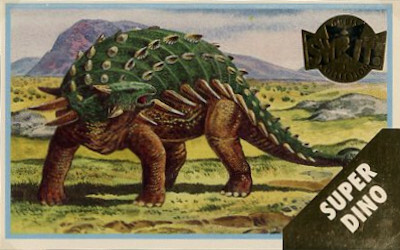 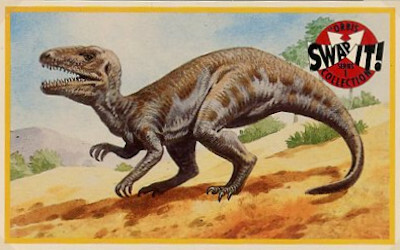 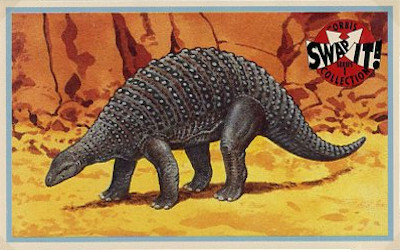 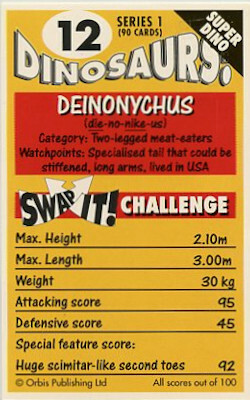 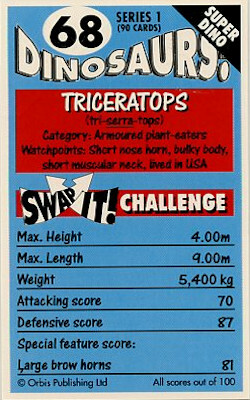 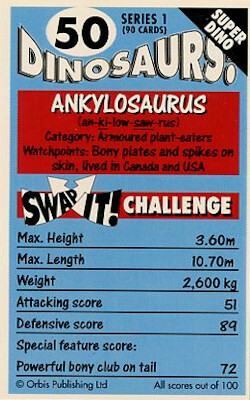 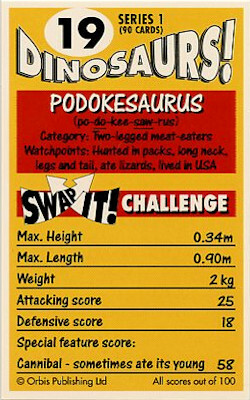 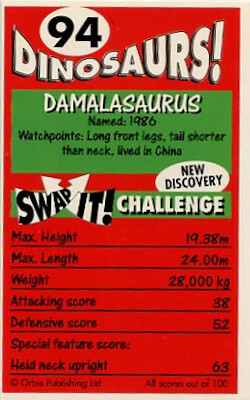 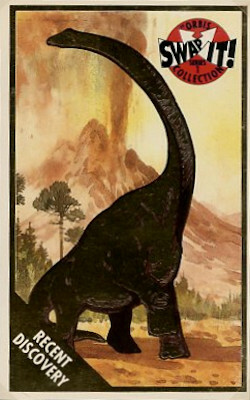 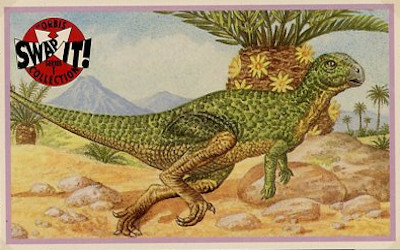 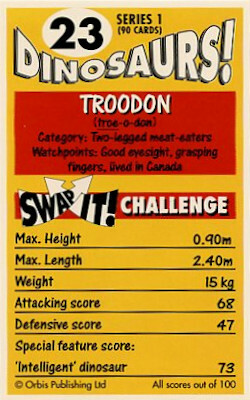 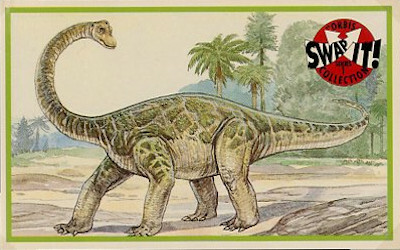 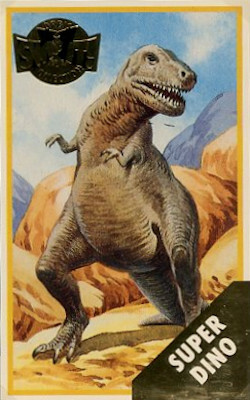 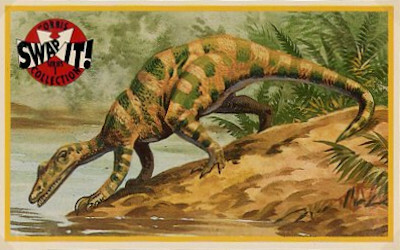 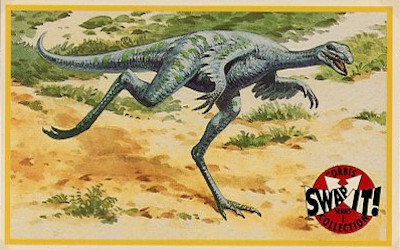 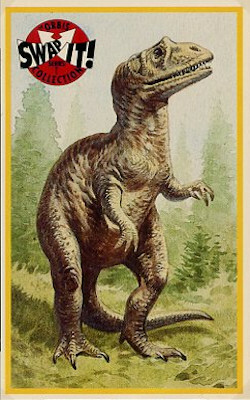 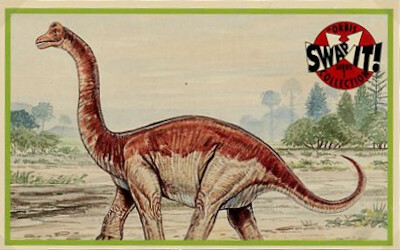 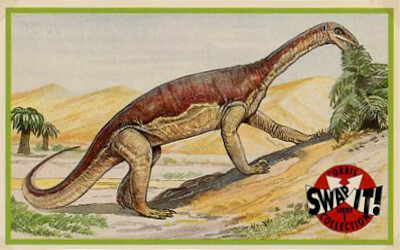 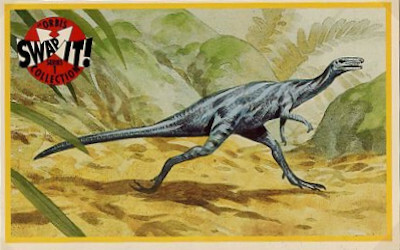 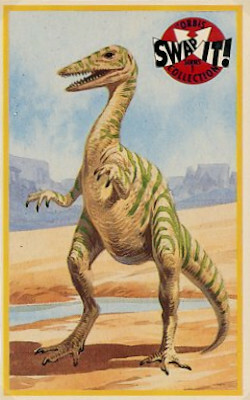 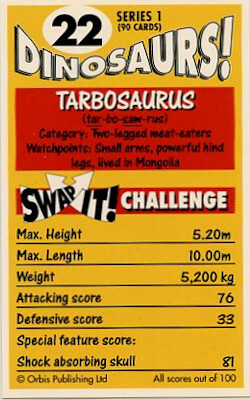 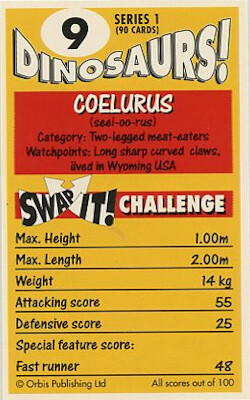 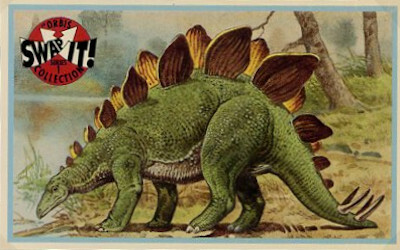 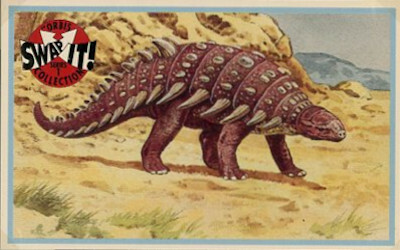 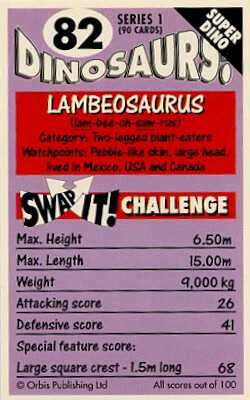 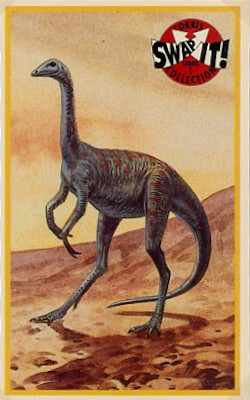 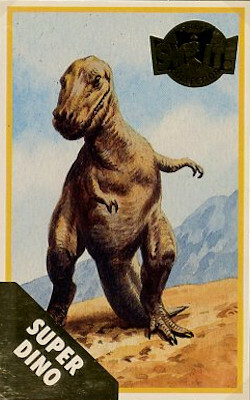 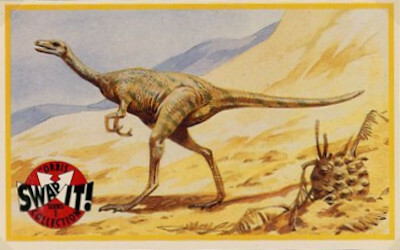 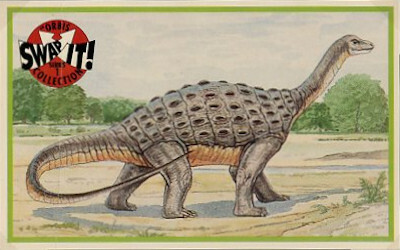 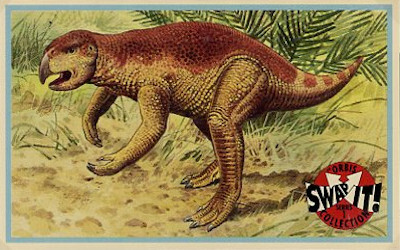 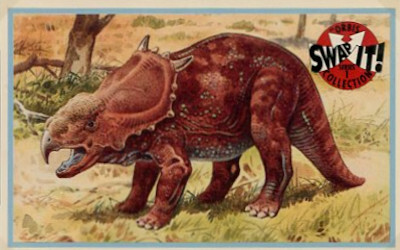 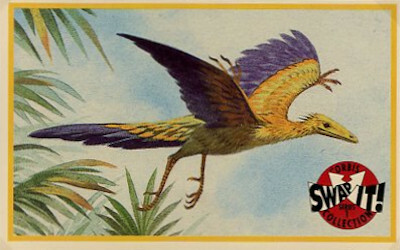 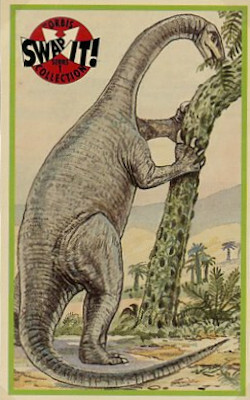 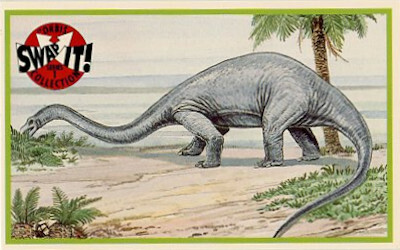 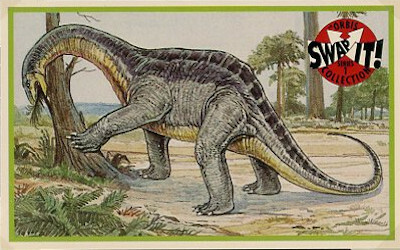 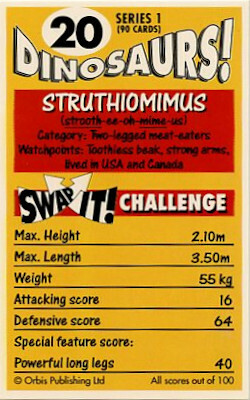 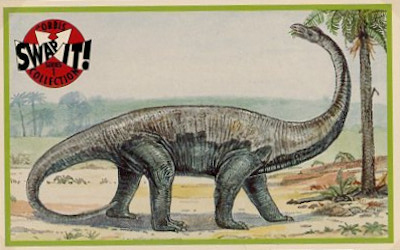 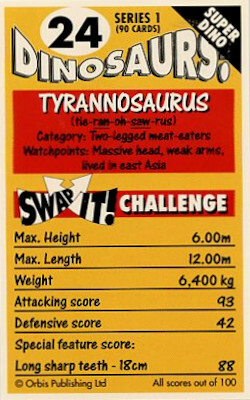 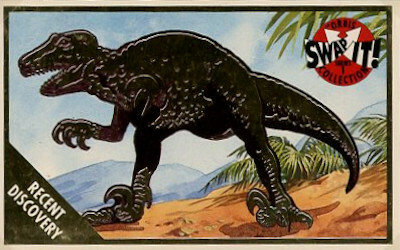 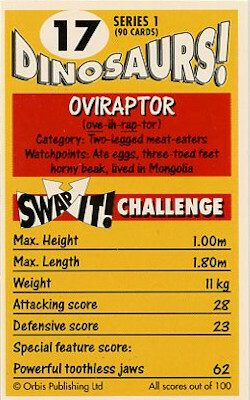 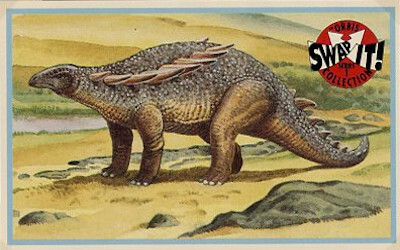 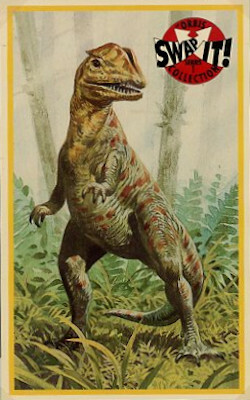 Logo indicating that the card is a Super Dino. 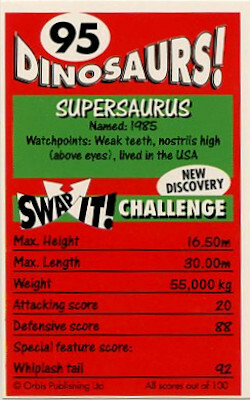 You will see "SD" next to the Super Dinos in the check list. 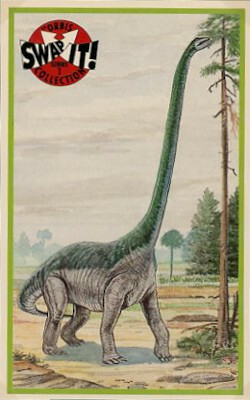 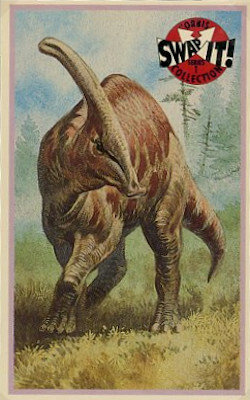 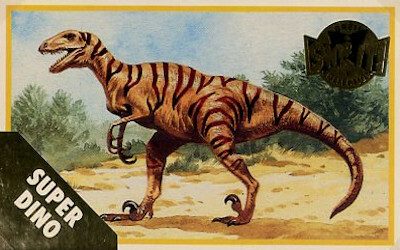 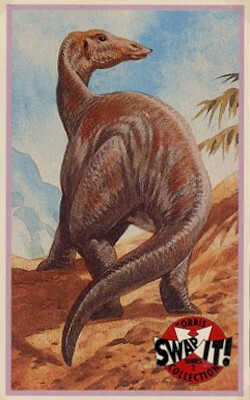 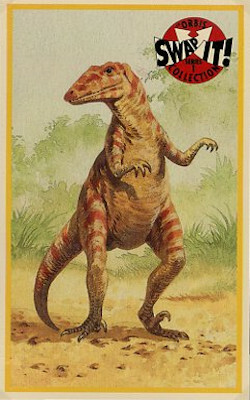 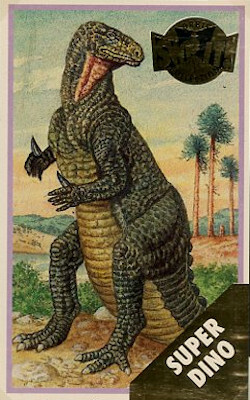 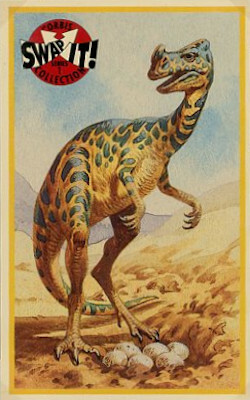 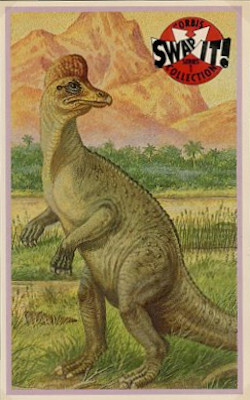 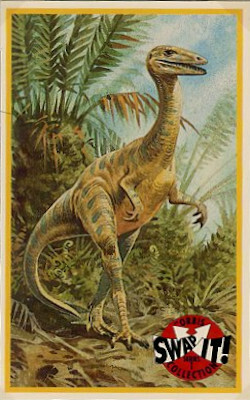 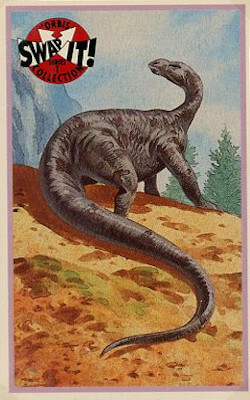 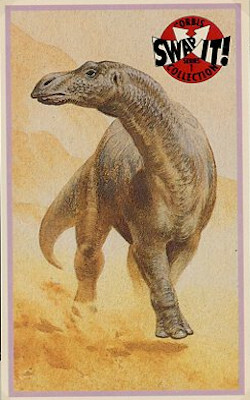 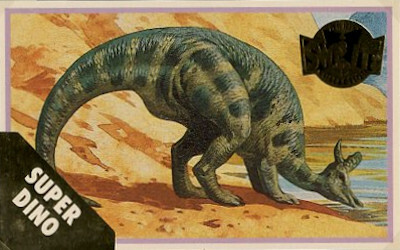 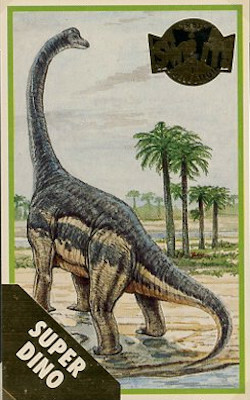 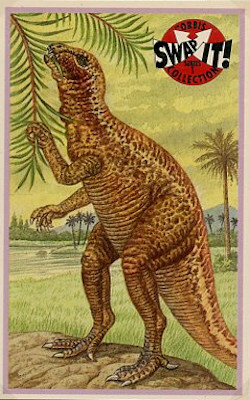 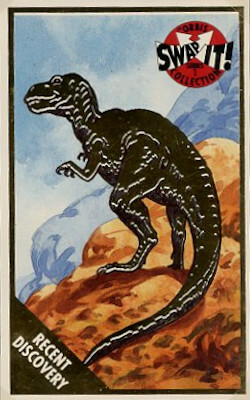 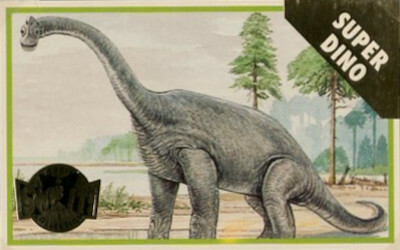 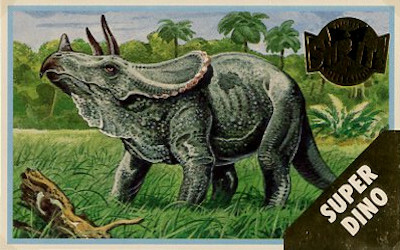 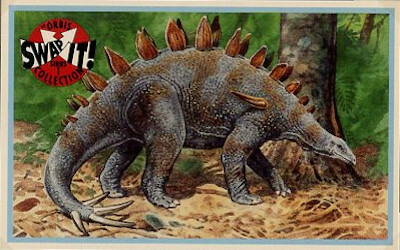 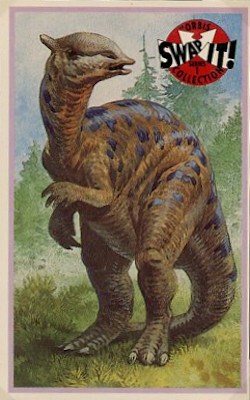 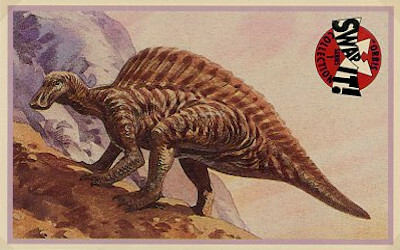 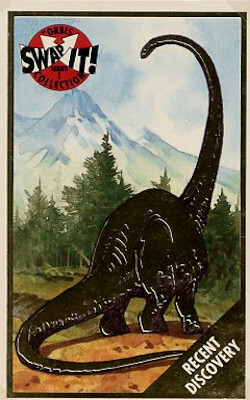 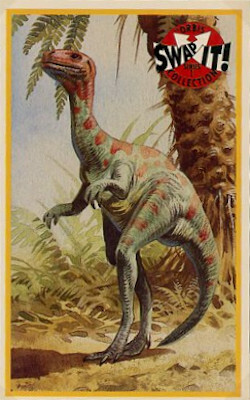 Also, the six Recent Discovery Dinosaur cards (#91-96), indicated with "RD" in the check list, have gold foil dinosaur pictures and a gold foil triangle indicating that the card is a Recent Discovery. 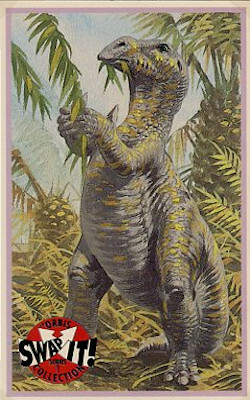 These cards seem to have had very limited distribution and are tough to find. 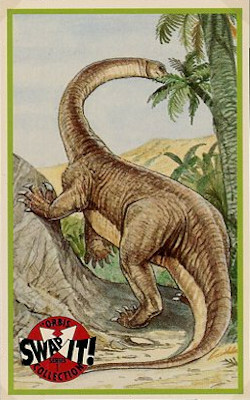 In August 2018, I aquired a pack of cards which contained all six of the Recent Discovery cards. 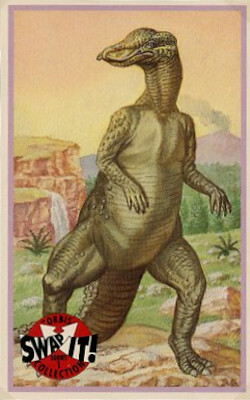 The pack containing these cards is actually labeled "Recent Discovery".